Tête Blanche (lit. 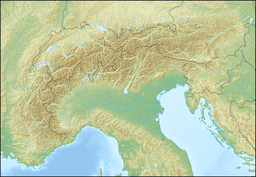 White Head, from French) is a mountain of the Pennine Alps on the Swiss-Italian border. Its summit (3,710 metres) is the tripoint between the valleys of Hérens, Mattertal (both in Valais) and Valpelline (in the Aosta Valley). Tête Blanche is generally the high point of the Haute route between Chamonix and Zermatt and the annually race Patrouille des Glaciers. Tête Blanche lies within a few kilometres of the Matterhorn and Dent d'Hérens on the east. ^ Retrieved from the Swisstopo topographic maps. The key col is the Col de Valpelline (3,557 m). This page was last edited on 3 May 2018, at 01:45 (UTC).